Protein denaturation at the air-water interface and how to prevent it. D'Imprima E, Floris D et al. eLife. 2019 Apr 1;8. pii: e42747. Structural snapshots of 26S proteasome reveal tetraubiquitin-induced conformations. Ding Z, Xu C et al. Mol Cell. 2019 Mar 21;73(6):1150-1161.e6. Unexpected receptor functional mimicry elucidates activation of coronavirus fusion. Walls AC, Xiong X et al. Cell. 2019 Feb 21;176(5):1026-1039.e15. Stepwise activation mechanism of the scramblase nhTMEM16 revealed by cryo-EM. Kalienkova V, Clerico Mosina V et al. eLife. 2019 Feb 21;8. pii: e44364. Structure of a bacterial ATP synthase. Guo H, Suzuki T, Rubinstein JL. eLife. 2019 Feb 6;8. pii: e43128. ChimeraX version 0.8 is available. See the change log for what's new. ChimeraX version 0.7 is available. See the change log for what's new. New Virtual Reality at UCSF website shares information on VR projects, resources, and related issues. Tom Goddard will be giving a ChimeraX tutorial on 3D microscopy visualization at the UCSF Parnassus Campus, Medical Sciences S-163, 12:30-3:30 pm. 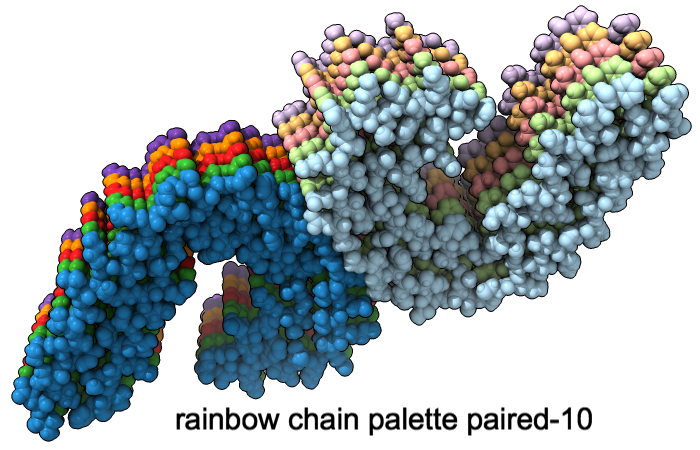 UCSF ChimeraX (or simply ChimeraX) is the next-generation molecular visualization program from the Resource for Biocomputing, Visualization, and Informatics (RBVI), following UCSF Chimera. ChimeraX can be downloaded free of charge for academic, government, nonprofit, and personal use. Commercial users, please see licensing. ChimeraX development is supported in part by grants from the National Institutes of Health (currently R01-GM129325, previously P41-GM103311). A “palette” or ordered series of colors is used to color items sequentially (rainbow) or by values such as density. 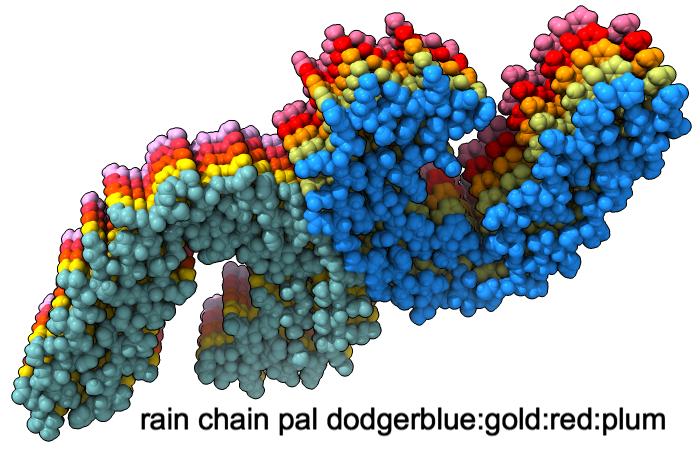 The ten chains in PDB 5o3l (paired tau filament) have been colored with the commands shown as 2D labels in the images. The first two examples at left use predefined palettes (credit to www.ColorBrewer.org, color specifications and designs by Cynthia A. Brewer, Pennsylvania State University), whereas the third shows specifying colors individually. Influenza neuraminidase is an enzyme that promotes the spread of influenza virus among host cells. It is the target of oseltamivir and related antiviral drugs. 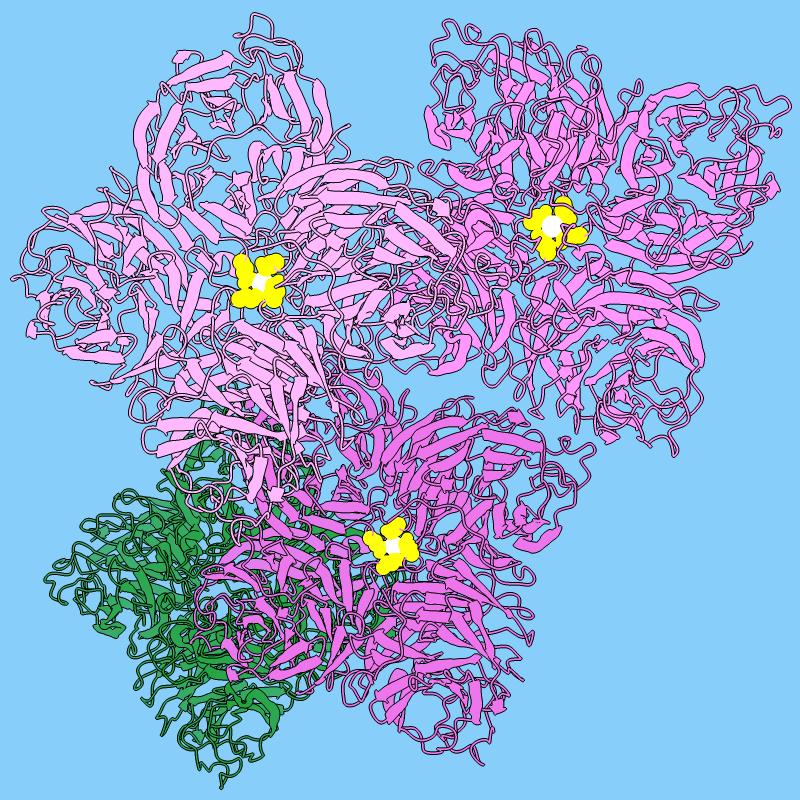 The image shows tetramers of neuraminidase (PDB 3k3a) styled as flowers. Three tetramers are in different shades of pink, with a central metal ion in white and nearby residues in yellow, and a fourth tetramer is colored green to resemble leaves. 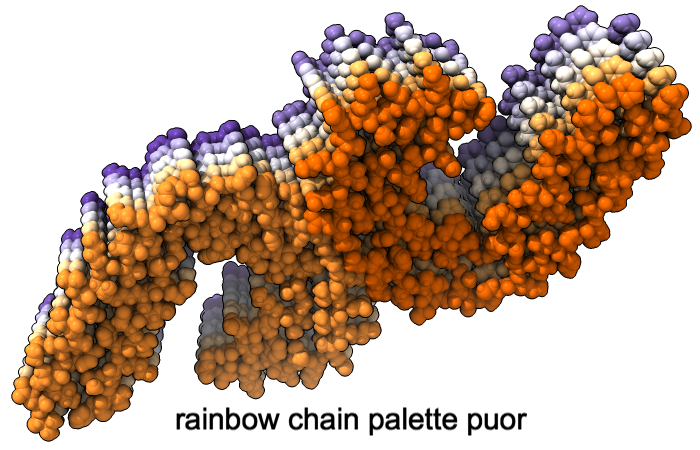 Each monomer or “petal” is a six-bladed β-propeller. For image setup other than orientation, see the command file flowers.cxc. The Chimera Image Gallery includes a similar image.